Darlings, in the left corner feast your eyes on Joie’s fantastical Phineas Velvet Blazer; to the right take a peek at Halogen’s luxurious Liquid Velvet Jacket. Though, like the Joie offering, the haute Halogen piece is constructed out of a viscose rayon/silk blend, it sports a two-button closure, whereas the Joie showcases an open placket. Despite the ever so slight difference; for just $138.00, as opposed to the $388.00 asking price of the jewel-like Joie, the Halogen pretty allows one to add a smattering of high-fashion velvet loveliness to their wardrobe, at a price that is fit for the budget babe! The Halogen blazer for sure=) I like the buttons, it makes it look more polished. Also the detailing makes it look better than the Joie blazer anyway. The Halogen one for sure!! I have a Halogen blazer that I've had for many years now and it's still in excellent condition! My mom and sisters are still eyeing the blazer after all this time! 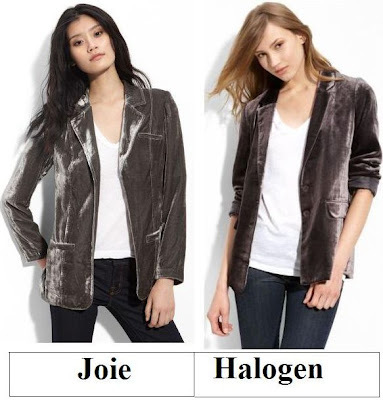 The Halogen Blazer looks more stylish than the Joie blazer. I don't know if it's the model wearing or how she's wearing it, but the Halogen one definitely looks better. I like the Halogen one better! I saw the Halogen one at Nordstrom- it's so cute! I very love velvet blazer...those are great! I like the Halogen one more than the Joie one! the Halogen one looks definetly bettter!! I think the Halogen one is much more flattering and slimming. And I love blazers so much! Maybe it's because I watch too much What Not to Wear (oh Stacey!) and Gilmore Girls (Stella McCartney was the stylist) but I just love blazers so much. Hope to see you between our followers! Love the combo of velvet and a blazer, it looks great. I'll go cool and thrifty with this one, I actually like the fit better. It's finally cold enough for me to wear a blazer today! What a great blazer! Thank you for another wonderful better deal. Hope you had a wonderful Halloweekend! I agree with the others who have said the Halogen version actually looks better! Oooh, velvet! Obviously you can't go wrong with either of the jackets; they're FABULOUS. But i'm especially spitten by Halogen. Something about the fit is a little more "ooh la la." I prefer the look of the Halogen version than the other. As much as I love Joie I'll take the Halogen. It looks a little darker and I like that. Great find!! I actually like the Halogen one better! hi darling. hope you're having a good week so far. because of the more loose-fit. you know, I don't think the Halogen model is actually wearing it that splendid. Wish the cuffs weren't rolled up. I'd never buy anything that expensive. A. I tend to gain weight during the holidays. B. I'm a messy person. I'd probably just see what I could find close to it at Good Will. You never know what you might find. Great finds, both of them! And as always I'm the cheaper, choosing that lovely Halogen one! I love the Halogen one! It looks like it fits a lot better! I love the Halogen One! Great pick! They are practically identical! I LOVE the Halogen one! A little less structured-feeling and so chic. Great find- the Halogen looks much better than the Josie. I dont like the nap in the velvet in the Josie one- it doesnt look like high quality velvet and for that amount of $ it should. Cute! It is amazing how you can literally always find something designer for cheaper. my heart just stopped..i am in love. the halogen version is right up my alley! Ooh I want to touch the jackets haha :) I really want something velvet! Nice!!! I miss this tightwad Tuesday thingy of yours Erika! Oh well, I do miss your entire weekly blog treats honestly. Oooh, I really like the whole concept of a velvety soft blazer. Halogen for me! Halogen, no doubt about it! Not liking the structure of the Joie. I like Halogen blazer It is really Awesome!!!!!!!!!!! Erika you are fantastic all your blog is so Awesome that I never miss it. I am your great fan. I really like the Halogen blazar better.